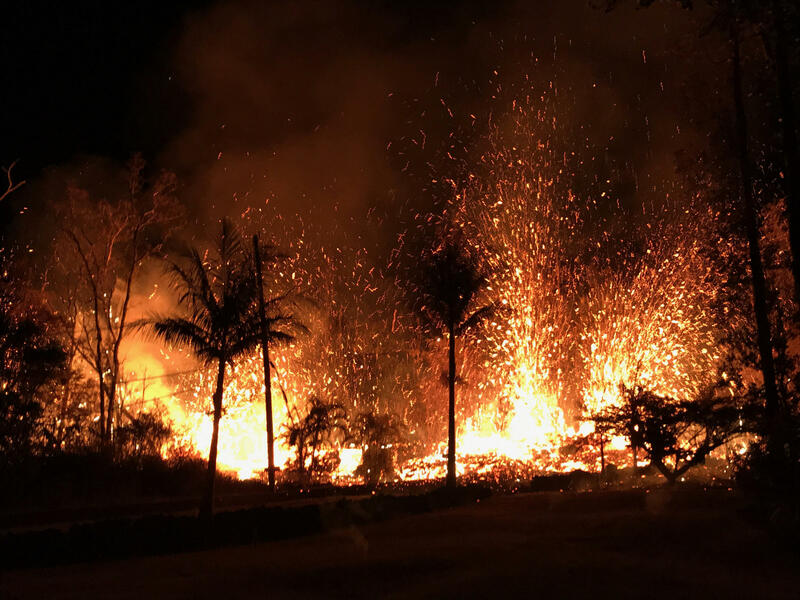 U.S. Geological Survey photo of eruption along the Kilauea East Rift Zone in the Leilani subdivision on the night of May 6, 2018. As personal stories and emergency updates continue around the current Kilauea eruption, Hawai’i’s resident teams of expert volcanologists continue their research and observations. How is this eruption different from others? How could a tsunami be generated? HPR’s Noe Tanigawa reports. "Several of us at the University have been debating the historical precedents from the last couple hundred years of historical record at Kilauea." Kenneth Rubin is a volcanologist, a professor and Department Chair of geology and geophysics, UH Manoa. Dr. Rubin says Kilauea has three main places it can erupt. The summit, where Halema’uma’u has been active over ten years, and the small southwest rift zone which was last active until 1974. 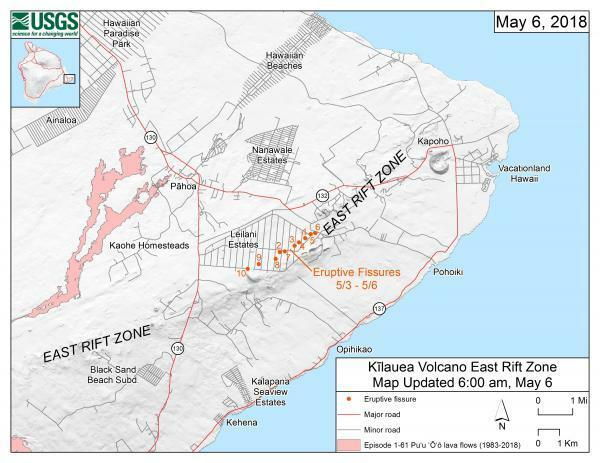 Then, there’s the 40 kilometer East Rift Zone that goes from the summit to Pu’u O’o, then into Pahoa and Kapoho, continuing offshore another 50 kilometers. 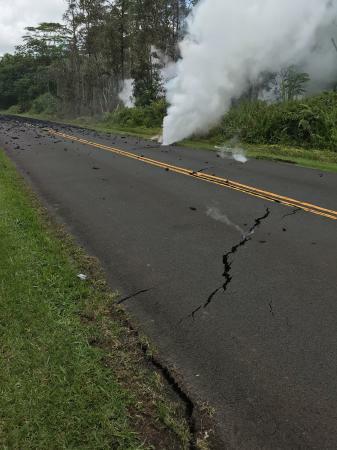 Lava overrunning a road way in Leilani subdivision, Hawai'i Island, May 2018. Rubin: The sequence of events that had Pu’u O’o shutting off, magma draining out of it, having a collapse of the cone and a huge earthquake, and then the migration of earthquakes down the rift zone toward the Leilani estates area, that’s a sequence we haven’t seen before. Rubin: We don’t understand yet the relationship between all this extra magma filling into the volcano and then all of a sudden the shutting down of Pu’u O’o, the large earthquakes, the migration of small earthquakes down to lower Puna. When magma moves along these cracks in the earth along the so-called rift zone, it makes little earthquakes along the way. Scientists say a small non-destructive tsunami was generated when the large 6.9 magnitude earthquake hit last week. Dr. Rubin says sometimes underwater shelves created by fresh lava can collapse and drop, triggering a wave that washes back to the coastline. May 4, 2018, 12:46 pm, a column of reddish brown ash rose after 6.9 South Flank of Kīlauea earthquake shook the Big Island of Hawai‘i. Rubin: This is something that is one of the significant hazards. It’s nearly impossible to predict when it’s going to happen, but in all cases, when you do have a tidal wave or tsunami, something has to change about the seabed. So when you have a 6.9 earthquake or a magnitude 5 earthquake and it happens on the island and not offshore, unless there’s a corresponding up and down motion on the sea floor, you probably won’t generate a tsunami. Rubin says in the 1400-1600’s, Kilauea volcano wasn’t erupting frequently, so water could build up at the summit, creating conditions more conducive to violent eruptions, once water and magma met. That kind of explosive transition into a more active phase is thought to have caused a pivotal turn in Hawai’i history. The collapsed crater in Pu‘u ‘Ō‘ō. This photo looks to the east, and shows the deep collapse crater formed on Monday, April 30, when magma beneath Pu‘u ‘Ō‘ō drained. For scale, the crater is about 250 meters (820 feet) wide. Rubin: In the history of the unification of the islands of Hawaii, you’ve probably heard the story that when King Kamehameha, when he was just one of the chiefs on the Big Island, they were about to have a battle and the volcano erupted and took out a bunch of the competing armies warriors. That was all part of the sequence of events that happened in the 1790’s. Rubin says local families have stories about past eruptions and inundations going back generations. Rubin: Puna district is the fastest growing area on the Big Island, in terms of people moving in and so forth. As long as people are aware of what has happened in that area in the recent past. The responsible thing is to know how to live with and mitigate the impact of eruptions that may happen in the area. Rubin: This eruption is happening in Hazard Zone 1. It’s got a very high probability of eruption and we know this from the recent pre-history and certainly old timers who have lived in that part of Puna, or whose families have lived in Puna for generations, have stories to tell about each one of these other eruptions and what the impacts were on the community and it’s important for people to remember that, to know what those hazards are. The current eruption started with a series of earthquakes, then cracks like this began to appear. Before long, molten lava emerged from some of the asphalt cracks. Dr Rubin says it’s not as though the Ring of Fire is going up in flames or anything right now. He says there are pretty much always ten to twenty volcanoes going off on earth at any given time. 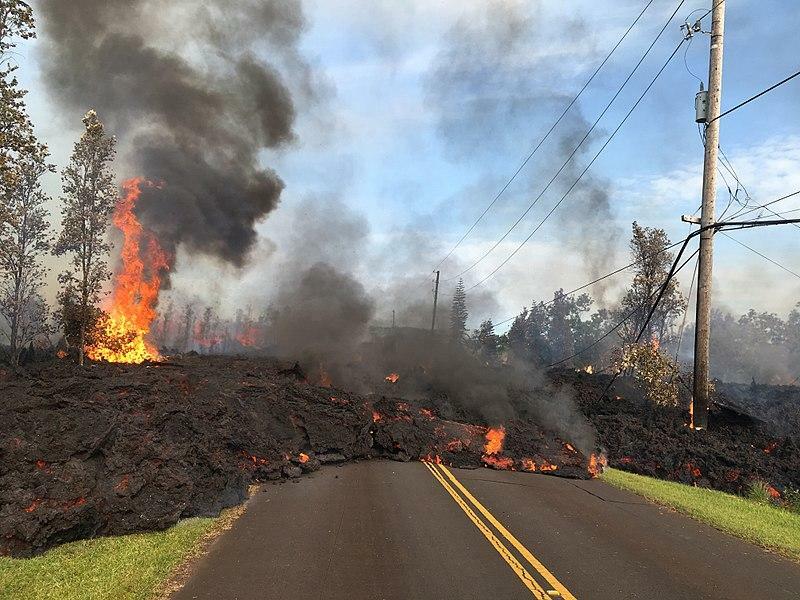 Kilauea just has the headlines right now. To see a compilation of current volcanic activity, check the Volcano Discovery website. Find an interesting list of explosive Kilauea eruptions compliments of the USGS here. Find an interesting USGS chronology of Kilauea here. It's been a dramatic new year so far for one of Hawai'i Island's most spectacular sights. 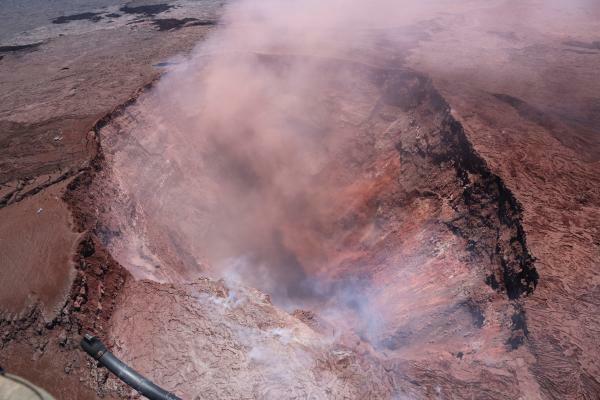 The Kīlauea Volcano has been continuously erupting for 34 years—but there have been some changes since January. 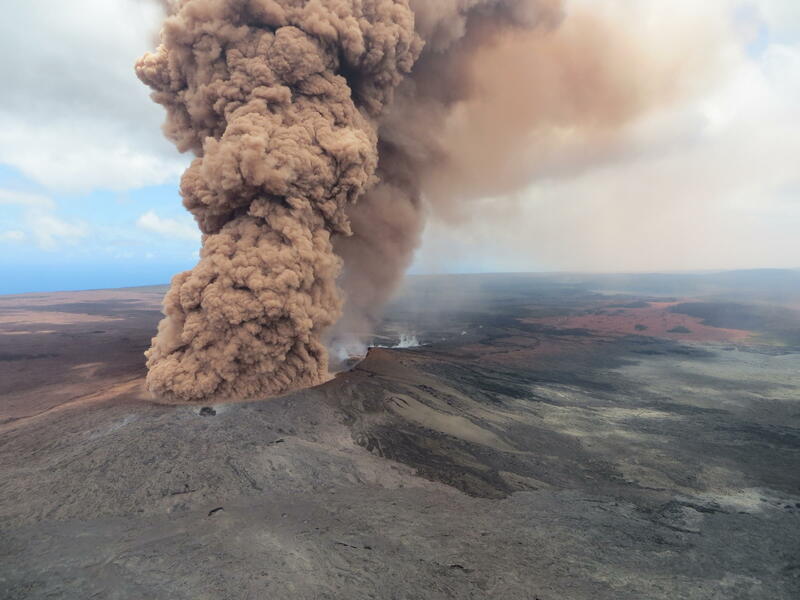 As for current conditions, HPR contributing reporter Sherry Bracken got an update from scientists at the Hawaiian Volcano Observatory. Activity at Kīlauea Volcano on the Island of Hawai'i is shifting this year, as it does each year. It's been erupting continuously since 1983, but there are always changes, sometimes dramatic, and sometimes more subtle. On Hawaii Island, HPR's Sherry Bracken talked with scientists at Hawaiian Volcano Observatory to get an update. Juvana Soliven’s beeswax sculptures could make you feel a little weak in the knees. She plays with things that are solid and stiff and other things that are droopy and soft. C.B. Forsythe’s intricate threadwork combines familiar detritus from the past with contemporary intention. HPR’s Noe Tanigawa offers this look inside their work, which is on view now at First Hawaiian Bank Center downtown.